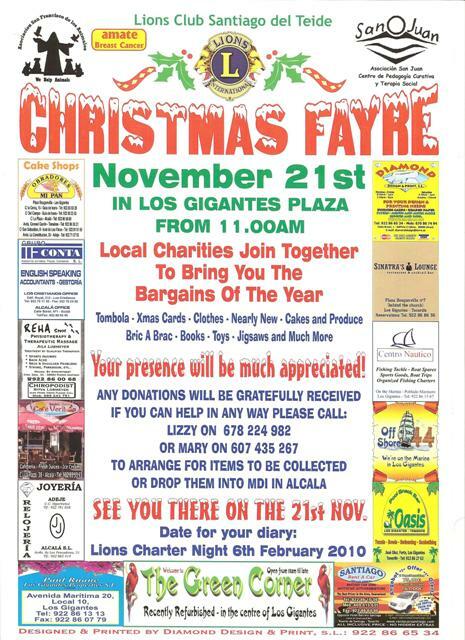 The Ayuntamiento of Santiago del Teide in conjunction with Pancraico Socas Gym, has put together a series of events for children and adults at the Laguilo in Los Gigantes, which is free. The Los Gigantes Laguillo is a natural lake with a huge sunbathing area for sun lovers, it will be opening its doors at 8:am sharp till 9:am free for people to partake in the activities offered. 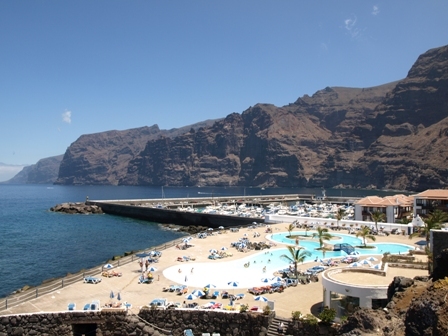 Due to the closure of Los Gigantes beach Laguillo has reduced its entrance fee to the price to 1,50€ with use of sun beds and umbrellas at a reduced price as well this will continue until the beach re opens. 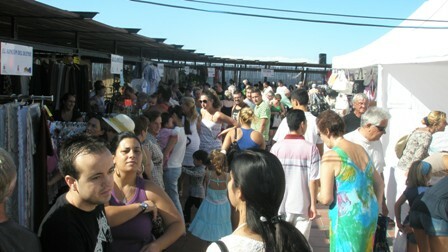 Laguillo is situated just before you enter Los Gigantes marina opposite the beach entrance. 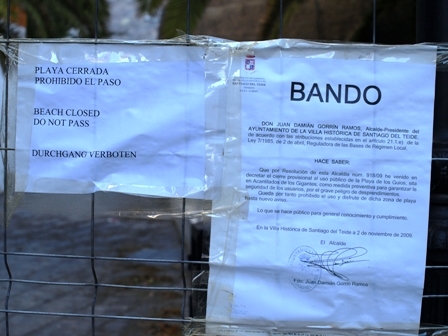 Santiago del Teide mayor, Juan Damián Gorrín, has announced that the beach will remain closed for at least four months this announcement is yet another nail in the coffin of the area small business sector, already suffering from the fall in visitor numbers. 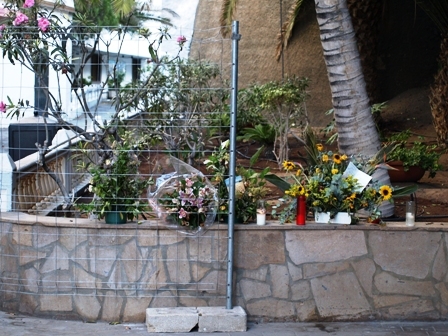 Mayor Gorrín repeated claims that the council had previously submitted plans to stabilise the cliff face but that these plans had been rejected, a claim that has been denied by the Department of Coasts. 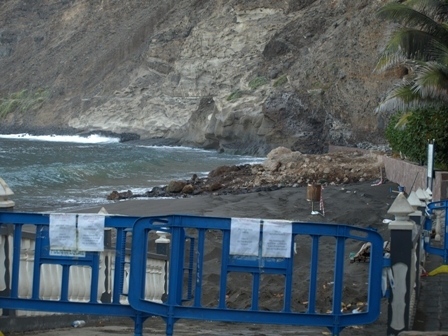 In a preliminary report made by the Instituto Canario de Investigaciones de la Construcción, (Icinco), into the landslide on Los Gigantes beach says the rock fall was probably caused by water. Their report points to a water source which runs through a small natural tunnel in the cliffs at a height of around eight metres. Experts believe it was the increase in humidity and damp from this source that has, over a long period, seeped into the cliffs, weakening the rock face. 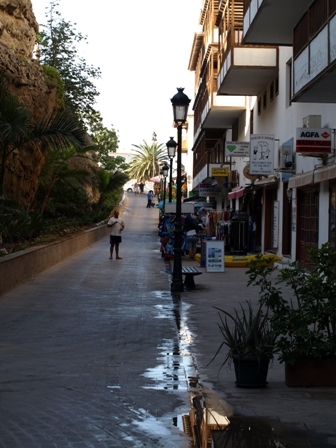 In what many view as an extraordinary outburst, Mayor Gorrín claimed that the Department of Coasts had rejected every plan put forward for improvements to the shoreline in Santiago del Teide, while at the same time approving plans submitted by Socialist administrations in other municipalities.